Howard Carter, Conan Doyle and Sherlock Holmes are giants. Everybody is impressed by the amazing mask of pharaoh Tutankhamun. 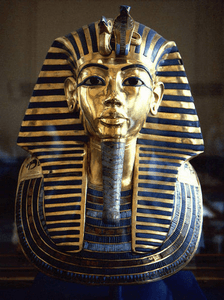 The death-mask was made of gold, coloured glass and semi-precious stones. It is not perfect, because it had been made in a rush, but yet it is a wonderful symbol of Egyptian culture. When I was a child, I saw its beauty only, but as an adult and as a Sherlockian it is my duty to find out what is behind masks. Now I know that the ruler's adornment carries the magic of Egyptian art and the mysterious life of a young pharaoh, and what is more, I see in it the symbol of hope as well. Behind the mask of Tutankhamun there is the heroic work of legendary British archeologist Howard Carter; there are all his hopes, his whole knowledge and his huge mercy for humanity – they are all there, just as the canon of Sherlock Holmes contains the same abilities of its author, Conan Doyle. Howard Carter was an unwholesome child, so he learned at home from his father. Conan Doyle fled from his father's alcoholism to the world of tales with his mother. No doubt both boys picked up vivid imagination, curiosity and hope at an early age from their preceptors. Later both Howard and Conan had such a thirst for knowledge that they continually educated themselves as adults. The increasing knowledge resulted in that they knew people better, they knew their ways around their own profession and around the other fields of life as well. They used their brains intesively, so they could better draw a lesson and they were aware of the relationships. They understood things that others not, and in addition they became more persistent and patient. We can observe these characteristics in Sherlock Holmes as well. While investigating, he dares to rely on his power of imagination, he dares to believe that he is able to solve the case. Just like Howard and Arthur, he continually educates himself. As he puts it: 'They say that genius is an infinite capacity for taking pains,' he remarked with a smile. ' It's a very bad definition, but it does apply to detective work.' (A Study in Scarlet) Though in some adaptations he is portrayed to be impatient and antisocial, Doyle's hero was a very patient man. He was not antisocial either, because he kept in mind that his work is useful for the whole society and he could forgive. At his leisure time he conducted different experiments and had an index of crimes – these too helped him in investigating and to increase his knowledge. Conan Doyle tried to find a publisher for the adventures of the great detective several times before he succeeded. Howard Carter had to tread a much more difficult path. The British man searched for the lost pharaoh's tomb for long years. Yet when they became famous, they needed even more persistence and they had even more work in front of them. And they had to work before the eyes of the curious public, but they met the requirements. Famous people are in want of patience and logical thinking, and they both had these. Sherlock Holmes worked in the light of fame as well. He learned the tricks and the thinking methods of criminals to be more efficient. Before finding Tutankhamun Howard learned the methods of treasure thieves, and thanks to these among other things, he could save the invaluable pieces for the upcoming generations. He not just fought against thieves, but he had to watch his workers, the guards of the Valley of Kings, the journalists, the tourists and to be in touch with his sponsors. Above so many things he did the heroic work of excavation, which had enormous historical responsibility. Yet he did not crack up. His abilities that had been improved to be singular, helped him to successfully harmonize each work phases. The load which lay on his shoulders would be unthinkable to most of us. But Carter could listen to his workers and when the authorities hindered their work, he called out. For a little time he stopped his work, as Sherlock Holmes had to do the same after Reichenbach. Later they both returned to their beloved professions. There were times when Conan Doyle felt his creature, the great detective is putting an enormous strain on him. He was either identified with him or the readers asked him to continue his adventures. In The Final Problem he got rid off him, but in the end he returned to the character. For those who are familiar with the canon or only parts of it and found the time to think on them, it is apparent that there is many wisdom and humanity in them. In the Victorian era – just like in our present age – lots of people were hopeless. Doyle, who was an educated man, felt that by dividing his knowledge he is able to help these people. (The wise sayings of the canon are still relevant today.) Once he ended the adventures, but he judged that there is a strong need for these stories, so he continued writing. Being humane was not alien to Sherlock Holmes either. When he thought that the criminal acted under provocation or his deed was accidental but he is not dangerous for other people, he took pity on the person and let him go. One fantastic feature of Howard Carter, Conan Doyle and the great detective is that although their profession needed lots of energy, they did not become lethargic and in spite of the negative pressure of fame they performed outstandingly, and at the same time they were humane. England and other nations rightly treasure their memory. Conan Doyle's Sherlock Holmes never lived, but countless people love him so much that we talk about him as if he was alive. But Howard Carter also made a hero alive. In old-world Egypt it was a firm belief that a person lives till his/her name lasts – till it is pronounced or thought of. Excavating his tomb, Carter made Tutankhamun alive, at any rate according to the belief of the Egyptians. 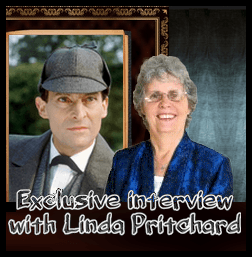 It is a well-known fact that Sherlock Holmes, who is often portrayed to be emotionless, kept Irene Adler's photograph, who was the only woman to outsmart him. Many people think it shows that he was in love with her. Sherlock kept the picture to remind him that he erred while investigating her case, and the photo proved that there are brilliant minds except him as well. For him Miss Adler was much more fair than the King of Bohemia who promised marriage to her. The photograph also reminds him that not the financial or social status defines one's moral values. Howard Carter kept a not too valuable ring from Tutankhamun's treasure. Unfortunately some documentaries state that he stole the ring. The truth is that he recorded in his diary that he kept it, he never denied the fact. He did not steal it. He fancied the nice jewel and kept it as a reminder – bear in mind that he had never been truly accoladed for his heroic work; so he just wanted to have something for himself, after he gave back priceless artifacts to the world. For him the ring was the symbol of beauty, of antique art, of life and death and of the pharaoh himself as well. It proved to him that it was worth to be persistent and work hard for such a long time. Carter had many chances to steal, but he did not do it, so the ring also shows his squareness and temperance. Besides the archeologist became so famous that most people who met him wanted him to talk about the excavations and to show one piece of the treasure. He could easily bring the ring with him, he even could identificate himself with it, because the name of Tutankhamun was carved in it. The ring also represented the elegance of Egyptian art. This object reminded Carter of one of his famous works, just like the photograph of Irene Adler recalled a case for Sherlock Holmes. While the picture was the symbol of a failure, Carter's ring had been associated with a success. The archaeologist travelled through the USA and held lectures on Tutankhamun. Conan Doyle also visited many cities in America and spoke about spiritualism. (More information: Sherlock Holmes in America) Egyptians tried to insult Carter because of bringing the treasures to England, but the excavation costs were paid by Lord Carnarvon, so legally half of the treasures belonged to him. We have a separate article on how Sherlock Holmes and Conan Doyle could hope. (Recommended article: I believe in Sherlock Holmes) Howard Carter was no exception. It is worth to deal with his story, and with the canon as well, because both create a magic realm and teach us how to look behind the masks. It is necessary to find out the truth. A clever man learns to filter the information – that is, to ignore irrelevant or false ones. False legends of Tutankhamun, Howard Carter, Conan Doyle and Sherlock Holmes are not important (for example the curse of the pharaoh, that Carter was a thief, that Holmes and Watson lived in romantic relationship or Doyle killed someone for the story of The Hound of the Baskervilles). We have to learn to disbelieve in things like that, as Sherlock Holmes did not believe in vampires either or Carter was not worried about the curse of the pharaoh. We have to be able to look behind the mask: to recognize the fantastic work of these genuine people, to recognize that they were gracious and able to make the world a better place. Because of them it is worth to hope. Let's dare to remember not just Sherlock Holmes or the mask of Tutankhamun, but all the people who are behind them. It is our hope that we will be able to recognize our own values and those of others too, when we are patient and spare some time for think about it. To see the surface is not enough, the truth and the more exciting things lie often behind the mask.